I'm going to work on ways to make it more visually pleasing if I go with the mouse driven looking system. If no mouse looking then I have to redo the inventory system for keyboard only. FrikaC showed me once how to get a forward and reverse speed for player, but have no idea how it works. It involved dot products and that's way too advanced for me. Anyone know? Since you're using Darkplaces (but IIRC it's supported on FTE too) you can resort to the .movement vector. Just read it and you know if you're going forward or backward or strafing and at what speed. //positive means its in the same direction, negative means its the opposite (eg v_backward). the magnitude is the length of the vector in that 'axis' - if both vectors are unit vectors the result is guarenteed to be between -1 and 1. //for completeness, to understand the values, this is the reverse of the dotproducts above (float*vector are NOT dotproducts). this is basically 3*3 matrix transforms. one transform is the transpose of the other, and transposes of a matrix is the inverse of that matrix when the matrix is a standard 3-axis perpendicular matrix like you get from makevectors. throw in an add+subtract for an origin along with a second call to makevectors and you have a nice way to rotate something around a point. or you can just use .movement, which tells you the player's intents (effectively those *speed floats before the velocity was even calculated, the raw value sent across the net scaled by cl_forwardspeed etc, but not sv_maxspeed). Does affect FTE too? Or in FTE it has been fixed? makevectors, view angles, bsps, and (oriented) sprites use 'standard' pitch. vectoangles, and mdls use inverted pitch (other mesh formats like iqm or md3 also use this style of pitch in order to allow drop-in replacements). but makevectors(monster.angles); is probably wrong. I say probably, because more often than not the pitch is 0 and noone will notice that the bug even exists. the bug is unfixable because 1) fixing it would break lots of mods that depend upon it being wrong. 2) the pitch's sign is context-sensitive and in situations where the context isn't easily inferable (like serverside), and its much simpler to just assume and add a *-1 than lots of logic to work around it. advanced engines have gained a load of assumptions around it that would need to be rewritten in order to finally 'fix' it, but noone can be bothered doing so because that would just break stuff anyway so there's not really any motivation to fix it. so no, its not fixed in FTE, nor DP, nor any engine that can still play quake which I'm aware of. Quake2 fixed it, if that helps. Model request. I need a similar thing but in model form. Doesn't have to be the exact same. Just a reference. I don't understand. Do you need a 3d low poly heart model like this or a 2d silhuoette of that image you posted, only extruded a little (to make it visible from every angle)? Because, in the first case, it could be tricky, for an artist not involved in your project, to create a model that fits your style. In the second case, just give 20 minutes! 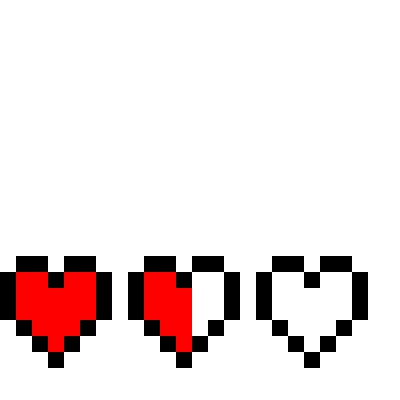 I would take a simple low poly heart, or a 2d heart that looks like the pics there just extruded a bit. Either way... I'm open to artistic interpretation. PERFECT! Love both options. I have a use for both. Problem. I can't convert .blend to .mdl. Could you export to .obj or even .mdl? Error wrote: PERFECT! Love both options. I have a use for both. EDIT: Oh wait... can't you use Noesis to convert it ? I tried Noesis and didn't see an option for .blend. Is there a plugin I need? But no animations whatsoever in this way..
Was trying to avoid it as long as possible, but I'm getting Blender now.